Since BT03, Amaterasu has lacked a concrete deck of her own. The spotlight has fallen on the Full Moon and Witch decks, with CEO as a supporting unit for the former and one that is run less and less commonly with each passing day. While there was never anything objectively wrong with Amaterasu as a boss card, it is nevertheless true that as an independent build she has been undersupported and lacking in a separate identity. BT09: Clash of the Knights and Dragons remedies this by taking Amaterasu to her maximum potential as the supreme face of Oracle Think Tank. The first vanguard for the Amaterasu deck is not universally agreed upon. Befitting of the definitive deck of Oracle Think Tank's leader, the deck has high synergy with almost every other card in the clan. Little Witch, LuLu from the soulless build can be used and is certainly an efficient choice as one of the only FVGs in the game that can give a +2 the moment her skills are triggered, and as CEO Amaterasu's megablast is even less likely to go off in this build than in her original one, this is a good use of the soul. Lozenge Magus can still be used as the first vanguard if you desire the extra deck space, but BT09 has generally outmoded her by introducing Supple Bamboo Princess, Kaguya. Based on the character of the same name from The Tale of the Bamboo Cutter, Kaguya is a base 4000 Forerunner that can be returned to the soul to give an OraThin +3000 power, fulfilling the same basic function as Lozenge while opening the field to call another unit and keeping another card in the soul, turning Kaguya into fuel for a megablast, Luck Bird's soulblast or to promote play with six soul units. With regards to those, because of CEO Amaterasu being a soulcharge-based unit, she has natural synergy with Tsukuyomi's six soul cards, and so it would also be a wise choice to use Godhawk Ichibyoshi from the Full Moon deck as the FVG. This imports the potential for a card gain each turn, the ability to control the deck through the formation of a trigger stack, and to use Half Moon's soulcharge to get CEO Amaterasu into the soul faster, while also giving Amaterasu access to Tagitsuhime as a 12000 power attacker. On that front, Amaterasu can also use her tsundere brother Battle Deity Susanoo, who has the exact same stats as Tagitsuhime, but his +3000 power comes from having a vanguard with "Amaterasu" in its card name, where Tagitsuhime operates off of just having six soul. A deck that uses Ichibyoshi and the Crescent through Half Moon cards is likely to run at least one copy of the Full Moon for a complete Goddess deck, and because of the ease with which six soul can be set up, Tagitsuhime may be the wiser choice over Susanoo. Amaterasu's personal supporting grade 1 is Battle Maiden, Sayorihime, a base 7000 unit that gets +3000 when she attacks if the vanguard has "Amaterasu" in its card name. Since there is no grade 1 equivalent to Tagitsuhime, Sayorihime is a good supporting piece for the build, but lacks the midgame presence of Kay and other decks with these types of units. The grade 1 space is more likely to be reserved for Oracle Think Tank's old mainstays like Dark Cat, Weather Girl Milk and Gemini, but you may find room among your tech cards for her. The upgrade that CEO Amaterasu has been waiting for is the Goddess of the Sun, Amaterasu, the solar counterpart to Tsukuyomi. With her full power unleashed, this incarnation of Amaterasu gets +2000 power for having CEO in the soul, over an 11000 base to create a very consistent crossride defense. Since Oracle Think Tank has a deep access to the deck and sees more cards per game than other clans, and can also modify the cards in the soul using Hare of Inaba and the Moon series soulcharges, this 13000 power is stable enough that it should come out in every game. With Milk's boost this comes out to a 23000 power total, accomplishing the offense of CoCo with a defense surpassing that of Tsukuyomi and Imperial Daughter. Furthermore, at limit break 4 the Goddess of the Sun can counterblast 2 when her attack hits the vanguard to choose any any Oracle Think Tank in the deck and add it to her hand. This skill has an immediate problem, in that for it to go off you generally need to be at higher damage than the opponent, as they are not likely to no-guard it unless they are at three damage or less and the number of cards under their control have been lowered significantly enough for defending to be impractical, and as a general trend the fighter who hits limit break first is more likely to lose. Even so, the skill is not unplayable. Oracle Think Tank is one of the best clans at playing defense because of its card drawing skills, and with a crossride defense Goddess Amaterasu is even better than past iterations of the clan. As a result, the Sun can afford to accept hitting limit break first in order to get the skill off. The real question associated with this skill is what to use it for. At the moment that Goddess of the Sun's attack hits the vanguard and you have paid the cost, you can do anything, but that freedom is paralyzing. More cynical cardfighters have pointed out that the skill would most commonly be used to search for a copy of Battle Sister Chocolat to have access to a perfect defense card, but your choice should be adjusted to account for the situation. There are cards in Vanguard that can prevent you from defending with grade 1s; against those decks you would want to search for other units with high shield, typically grade 0s. There are also situations where a perfect defense would be excessive due to already having one or more in hand, and in that scenario searching a card like Battle Sister Vanilla would be better. Since you can search for anything in the deck, you're also free to run more tech cards, giving you direct access to those techs through the Goddess' limit break while not needing to clog up deck space with extra copies of a card that you're realistically only going to use once. If you choose to use the Godhawk and Tsukuyomi line for its soul support, then probably the perfect card to match this limit break is Goddess of the Full Moon, Tsukuyomi. In this version of Amaterasu, after the initial grade 1-2 Tsukuyomi rides you would go directly to the Goddess, getting CEO into the soul through other means, and then using the limit break within the next few turns to fetch Tsukuyomi directly and ride her after that, reinforcing your hand with her counterblast. Because of how it cuts down on the amount of cards in the deck through repeated draw, superior ride, search and soulcharge skills, the deck's endgame is begun by switching back into the original Amaterasu. 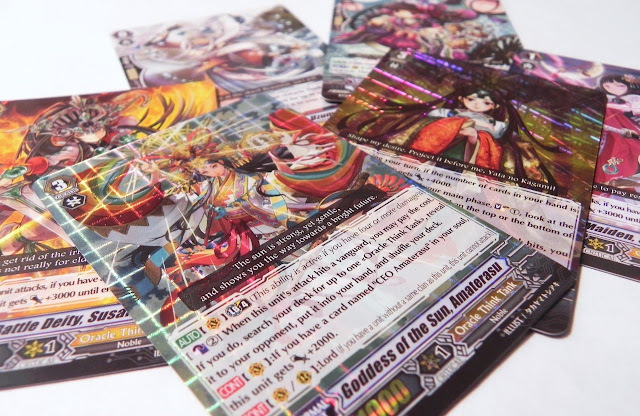 As there are typically only ten to thirteen cards left by the time this deck hits its endgame, CEO Amaterasu's future prediction will work within a terrifying margin to bring out the last triggers remaining. This kind of unprecedented control over the deck is only made possible by the synergistic fusion of the Sun and Moon, and it highlights all of Oracle Think Tank's best qualities. Other than using the limit break to search directly, it can also be used purely to force the opponent into bad decisions. If the opponent's choices are between letting Maiden of Libra hit and letting Goddess Amaterasu hit, they will choose Libra every time, and with your vanguard line at 21-23000, that will be at least a three card difference that you have carved out by drawing one with Libra and taking two away with their defense. The card isn't easy to use, but it does reward smart play. Goddess Amaterasu is one of the more difficult of the Oracle Think Tank decks to compose because there are multiple good ways to build her with no perfect answer. She complements almost everything, and because of that there are almost too many things that she can become. To strategize for her at high level play requires complete mastery of Oracle Think Tank and a deep understanding of the card pool. Next time that I revisit OraThin, it will be to discuss the Battle Sister deck reinforced by VGE-EB05: Celestial Valkyries, focusing towards more offensive play combined with draw draw power.